It doesn't get more patriotic than this! 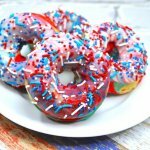 Red White & Blue Swirl Donuts are a true all-American treat! Perfect 4th of July party dessert! Step-by-step photo instructions inside. Preheat oven to 400°F. Coat donut pan with non-stick cooking spray. In a large mixing bowl, sift together flour, baking powder, baking soda, nutmeg, salt and sugar in a large bowl. In a a separate mixing bowl, whisk together milk, sour cream, and eggs. Add melted butter, vegetable oil, and vanilla extract. Slowly pour wet ingredients into bowl containing dry ingredients, stirring as you go. Divide donut batter into three smaller bowls, adding a few drops of red food coloring to one bowl and a few drops of blue food coloring to another. Leave the third bowl of batter plain. Spoon equal amounts of the three different colored batters into each of the donut molds, until filled. Bake at 400°F for 9 minutes. Allow to cool at least 5 minutes in the pan, then transfer donuts to a wire rack to completely cool. In a large mixing bowl, whisk together the milk, powdered sugar and vanilla extract until smooth. Remove about 1/8 cup of icing into a small bowl and add 2-3 drops red food coloring. Scoop 1/8 cup of icing into another small bowl and add 2-3 drops blue food coloring. Stir both red and blue frosting until the color is smooth and even, then drizzle each color over the big bowl of white glaze, making both horizontal and vertical lines. Dip the doughnuts into the icing, swirling about 90 degrees as you dip. Flip over so frosting is on top and place donuts back onto the wire rack. Coat with patriotic sprinkles while the glaze is still wet. Allow frosting to set about an hour.